Lisa Steib, RN, conducts food allergy testing on an MGHfC patient. MassGeneral Hospital for Children launches the Food Allergy Advocacy, Education and Prevention Program to support families beyond their patient visit. Supporting families in the communities where they live and learn is the impetus for the new Food Allergy Advocacy, Education and Prevention Program at MassGeneral Hospital for Children. Led by Wayne Shreffler, MD, PhD, the MGHfC Food Allergy Center helps thousands of patients and their families have the best possible quality of life while managing the risks of having a food allergy. Prevention and emergency preparedness are the pillars of food allergy management and should be implemented at all times and in all circumstances, Dr. Pistiner says. The school setting is no exception. Statewide, more than 33,000 students have a reported food allergy, and about 250 doses of epinephrine are administered annually in Massachusetts public schools. Twenty-five percent of these are to students whose allergies were unknown to the school. “Although many schools have policies and trained staff, they are not currently required to,” says Dr. Pistiner. Drs. Olsen and Pistiner testified at the Massachusetts State House in support of a Senate bill to establish food allergy plans. In his first month, Dr. Pistiner, who is also a parent of a 14-year-old boy with multiple food allergies, testified at the Massachusetts State House in support of Senate Bill 228 (An Act to Establish Food Allergy Plans). The bill requires schools to have food allergy policies, to train staff in food allergy management and to have stock epinephrine available and to ensure that certain staff members are trained to use it. Testifying along with Dr. Pistiner was Dr. Shreffler and several MGHfC food allergy center families including Christine Olsen, MD. Dr. Olsen is a Mass General radiation oncologist, the mother of a young child with severe allergies to sesame, peanuts, tree nuts and eggs, and one of the first advocates for the proposed bill. Dr. Pistiner teaches a parent how to read labels for hidden ingredients. Like Superman with kryptonite, a substance seemingly harmless to most people can make you very sick, very quickly when you have a food allergy. The harmless proteins found in common food allergens – milk, eggs, peanuts, tree nuts, shellfish, soy and wheat – set off adverse immune reactions that can be extreme and even life-threatening in some cases. While treatments are being evaluated now, no cure exists and the primary treatment is still avoidance, Dr. Shreffler says. Preventing allergies, especially peanut allergies, from developing in the first place is another goal. 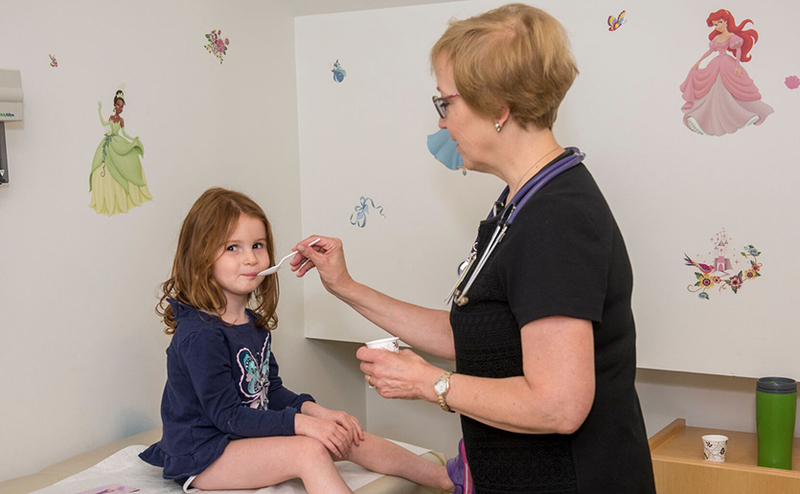 Dr. Pistiner is coordinating with MGHfC, Partners and other pediatricians to implement the new guidelines for introducing peanuts at all four-month well child visits. He works with a specially trained team comfortable in performing food challenges on children as young as four or five months. Studies show that early introduction of peanuts to infants who can tolerate it can decrease the allergy by as much as 80 percent. There’s some thought that this approach could be extended to eggs, milk, and other foods, he says. In the education arena, Dr. Pistiner has launched a food allergy management boot camp to “take away the scariness and myths around food allergies.” He plans to schedule monthly sessions and hopes to bring programs to schools, camps and other community settings. The boot camps are not only for parents new to the food allergy world. Veteran families also will benefit from the opportunity to ask questions and learn from experts about reading labels, administering epinephrine and avoiding cross-contamination. Dr. Pistiner encourages parents to send others involved in their child’s life including babysitters, grandparents and coaches. Drs. Olsen and Pistiner meet with Senator Cynthia Creem, who sponsored the bill. Educating healthcare providers at Mass General and beyond is also a key part of the new program. Continuing education sessions, online materials and grand rounds will help providers learn more about food allergy management, anaphylaxis and the latest peanut guidelines. To support the Food Allergy Advocacy, Education and Prevention Program, please contact us. For more information on the status of SB 228, please contact Dr. Pistiner. Your donation will help speed the development of new therapies to help families.